The look hasn’t changed much from the Kobo Glo with very similar styling except of course this one comes with a significantly larger screen. The back however is a departure from the flat back of the Glo and other eReaders and features very nice ergonomic angular grooves making it very friendly for your hands. It actually make it easier to hold than just a pure flat bottom as it conforms to most people’s hands. Your fingers actually rest perfectly between the middle fold of the back grooves, making it easier to hold than a physical book for long periods of time. There aren’t any buttons on the front and page turns are performed by a swiping motion. Along the bottom of the device there is a micro USB for transferring data and charging, micro SD card slot (capable of handling 32 GB of storage) and a hard reset button. On the top you have an LED indicator light, glowlight activation and an orange power button/standby button. The Aura HD measures 175.7 x 128.3 x 11.7mm and weighs 240g. What’s so exciting about this model is that it has the highest resolution out any 6 inch or 7-inch eReader on the market with extremely crisp text that actually blows away the Amazon Kindle Fire HD as well as the Barnes Noble’s Nook HD+. The screen itself is 6.8-inch and features WXGA+ Pearl E Ink . This screen has been branded by Kobo as the ClarityScreen+. In addition to the 6.8-inch display, it’s has a 1440 x 1080 pixel resolution with 265ppi,. 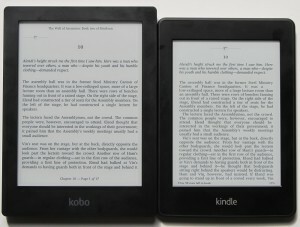 This makes the Aura HD’s clarity and sharpness in a different league to other eReaders including the Kindle Paperwhite 2. To access the glowlight you press the button at the top to turn it on. Even on it’s lowest setting it is still possible to read it in the dark. This is one of the whitest lights we’ve seen and easily on par with the Kindle Paperwhite 2 with a uniform spread of light across the whole screen. The main home screen on the Kobo Aura HD is very different from previous iterations of the company’s line of eReaders. The icons here are all dynamic so as you access menus and features it will change. With recent web browsing history, new books added , shelves and a sync button. The sync button remains consistent which means if you make purchases on the website or with apps on your iPad or Android tablet it will sync all your eBooks. There is also a shortcut battery life, help, Wi-Fi, sleep and power. You can also configure the illuminated glowlight functionality to automatically shut off as well as configure sleep when the device powers off. So if you tend to read maybe 15-20 minutes before you go to bed at night you can make it so the battery drain is negligible by automatically turning the glowlight off. Within the extras setting are the games and you can also access a web browser which actually feels a little bit more polished than say with the Kindle or Nook and Google tends to load up pretty quickly. You can search more text heavy sites. Image heavy sites on this eReader (or any come to that) aren’t handled that well. The library is where your house all your books and with this view you see you can see covers listed. 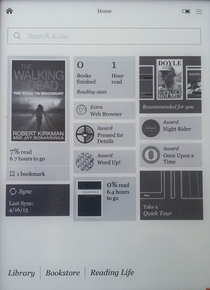 To get more data, select the list view which tells you what ebook format it is in and gives a little bit more data. You can also create different shelves. This is handy when you have a lot of books because the main shelf can get pretty cluttered. You can use different shelves for different genres such as romance, crime, etc and group all the books into that shelf. Kobo’s bookstore is mainly text heavy and has a huge amount of books, comics, periodicals to choose from (over 3 million). When it comes to buying a new eReader it’s all about the eBook reading experience. Page turns are very quick but you will still get that black refresh every 1-6 pages based on what you set it at. 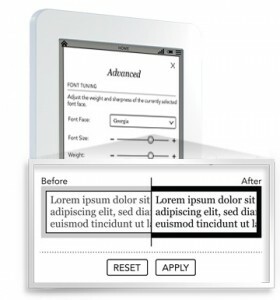 Pressing on the middle of the screen brings up both the top bar and the bottom bar which shows how much percentage was read, quick navigation from left to right in terms of pages, table of contents, annotation, search both dictionaries all under this book icon and the most important setting would be the font size and the font augmentation because you can choose the font faces, font-size, line spaces, margins and justification. So you can see that there is quite a few things you can do here but Kobo takes it one step further to give you the weight and sharpness and a before and after look at what your changes will look like. If you don’t like it, you can make the font a little bit bigger, maybe a bit darker or soften it up a bit. When you are happy with it, press Apply and your book will now change to your settings that you have chosen in the Advanced menu. You also have the option of loading in your own fonts. Pressing and holding on a word not only sets up your anchors but also gives you definition, Facebook Share, Search for the definition, multiple definitions, notes and highlight. Selecting the pen icon at the bottom of the screen bring up highlight and notes. This brings up a very nice keyboard which is spaced out really well with a dedicated row up top for numbers, accents and all those kind of extra characters at the bottom. Notes can be shared on various social media platforms. Kobo have really catered it toward readers because it’s a reading device but have also gone that extra mile with annotations, notes, highlights, being able to change and load extra fonts and a ton of other stuff. So how does the the Kobo Aura HD handle PDfs with it’s bigger screen and extra resolution? When side loading a PDF you sometimes find it may not be formatted properly. For example you may find it is stuck in the top corner. What you can do is press this directional pad button on the bottom and we can choose to fit with width, height or change it to landscape. From here you can do a couple things you can double tap this brings it into navigation mode, move to where on the page you want, let go and it will then render leaving everything’s nice and crisp and centred. PDFs render on the Aura better than they do on the Kindle Paperwhite. Also with the Kobo there’s a page-turner there so you can actually turn the page and maintain that level of zoom. That’s important because a lot, about ninety-five percent of the eReaders on the market when you find that sweet spot you often lose all your settings when you turn to the next page. Kobo has now overtaken Sony in terms of an eReaderthat offers the best reflow.There’s no pinch and zoom but you can turn pages flawlessly, you can do quick navigation, look up the table of contents, select what chapter you want to go to and there’s an add to shelf but there’s really not too many up ways to change text reflow. You can still zoom onto pictures and as soon as you let go it renders immediately giving an incredibly detailed picture. It looks really good and if you’re into comics or Manga you are in luck as it supports CBR and CBZ . So if you’re into very image heavy content such as comics, cookbooks, kids books, things like then this is really going to shine & Kobo has committed itself to really getting behind ePub 3. Very soon you are going to be able to see more picture heavy interactive content come down the pipe. Battery life is 2 months (based on 30 minutes of reading per day) and the light doesn’t seem to take a hit on the battery too much at all. It has double the storage of most eReaders on the market today with 4GB which as mentioned previously can be expanded by up to 32GB with a Micro SD card. Using Kobo Anywhere you can also store your books on the Cloud. You can store all your information on Kobo’s cloud, including books, bookmarks, notes and other data that you have created on your device. Like most eReaders (except the Kindle Paperwhite which also comes in a 3G version) this is purely Wi-Fi only. The Kobo Aura HD price ranges from around $174 – $190 with Amazon currently the cheapest at $173.99. It’s obvious competitor the Kindle Paperwhite 2 for the non Special Offers version comes in $35 cheaper at $139.00, but the Aura HD does have a larger screen, with a higher resolution, crisper text and a slightly faster performance. When it comes down to it I’m a huge of the Aura HD. Having this crazy resolution really steps up the game and with the new 1GHz processor, everything is super quick. It really does cater to large international markets like Japan where Manga is very popular and also for people who live in North America. I think Kobo does a wicked job at being able to cater to both newbie users and very advanced users, with a very nuice interface and huge range of features. 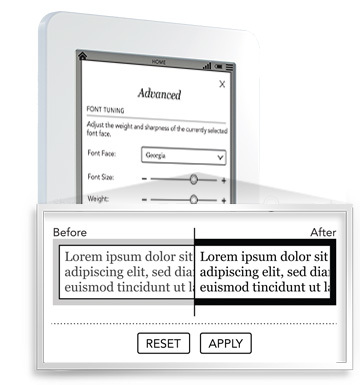 People that want to load in their own fonts, people who want like to be able have like a lot more control over their devices, shelves, being able to side-load books but not lose the dictionary like a lot of eReaders may be do. This is my current no.1 eReader choice.